Available from 14th November, Carluccio’s Christmas menu is packed full of delicious seasonal Italian dishes using impeccably sourced Italian ingredients. Highlights include Plin in Brodo, a traditional dish from Piemonte of pinched pasta stuffed with beef and pork in chicken broth; Antipasti, a board laden with baked ricotta served with pane carasau – a Sardinian flat bread – finocchiona salami, prosciutto Gran Sasso, poponcini peppers, balsamic onions, caponata and green beans; and the equally indulgent Lobster & Crab Lasagne or 28-day aged ribeye with truffle butter. For vegetarians, there’s a delicious dish of Zucca con Verdure Arrostite, roasted butternut squash served with vegetables and pine nuts and a festive risotto of mushrooms, Parmesan and roasted walnuts. Finish with Carluccio’s Panettone Tradizionale drizzled with Vin Santo Syrup, or Coppa Di Limoncello Mascarpone, mascarpone cream with limoncello, raspberries, crumbled amaretti biscuits and mint. Carluccio’s drinks list has everything you need for a festive get together from a fantastic range of Italian wines and festive fizz, through to Italian craft beers and seasonal cocktails including the Disaronno Marmalade Sour with Disaronno amaretto, Carluccio's clementine marmalade, lemon juice and orange. Not only will Carluccio’s fill you with festive food and cheer, but they’ll do your shopping for you – it’s nothing short of a Christmas miracle! Simply select your presents from the table-top gift wish list, order with Santa’s helpers (your waiter) and Carluccio’s will have everything wrapped and ready for collection at the end of the meal. This year’s beautifully curated Christmas gift collection, all from Italy’s best artisan producers, includes carefully wrapped gift boxes and hampers as well as chocolates, cakes and biscuits. Christmas wouldn’t be Christmas without panettone and this year’s selection is unrivalled. As well as the tradizionale and a stunning prosecco cream filled panettone, new to 2017 are two special varieties - a limoncello version with the flavour of Italy’s favourite citrus spirit blended with cream and candied lemon peel and a gluten-free panettone for one and all! Other perfect presents for foodie friends and family, or your own festive table, include a beautiful wooden cheese board and serving spoon with a fabulous fig jam made in small batches by the Zanuttigh family and a jewel-like selection of dark, white, almond and pistachio gianduiotti chocolates. Stocking fillers include baubles filled with milk chocolate Santa's and juicy candied clementine segments double-coated in rich dark chocolate. For the full Christmas range, please visit www.carluccios.com. 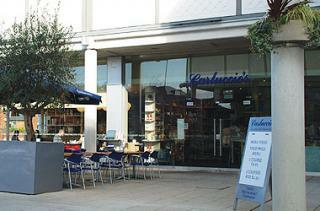 Escape the crowds this Christmas and head to Carluccio’s for fabulous food and your own personal shopper. White Stuff stocks cosy and stylish clothing, accessories, gifts, things for the home and much more.